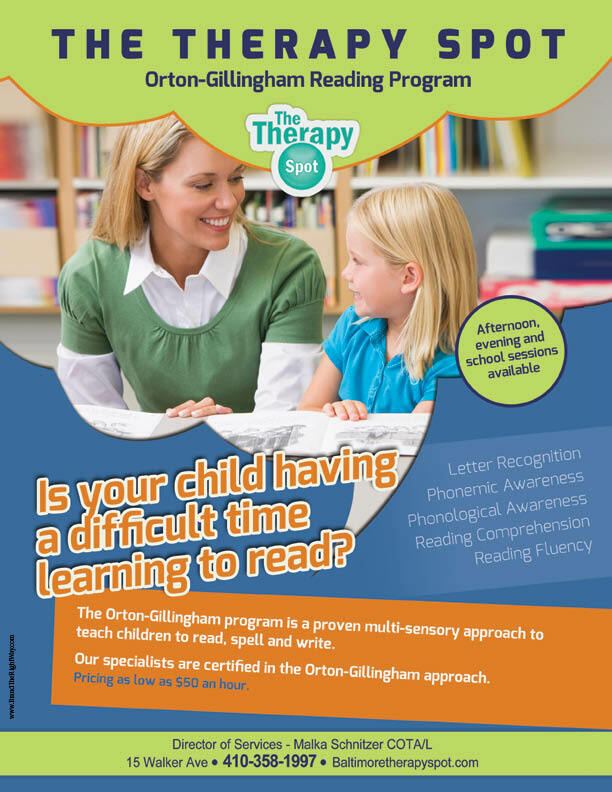 The Therapy Spot’s Orton Gillingham reading program offers tutoring services, teaching children to read, write, and spell using the Orton-Gillingham approach. Our tutors are trained and certified in the Orton-Gillingham method. Sessions are available in schools, as well as in the afternoon or evenings at The Therapy Spot clinics. Please contact our office to schedule sessions. Email us at info@thetherapyspot.biz, or call us at 410-358-1997. Orton-Gillingham is a multi-sensory alphabetic phonetic approach to teaching children to read, write, and spell. With this approach, students alternate between reading and writing the same sound, in the same lesson. Learning to encode and decode simultaneously reinforces the sensory pathways, as links are made between visual, auditory, tactile/kinesthetic pathways. This approach also uses a systematic and cumulative method to review and strengthen memory. Combination letter sounds are taught and reviewed until they become automatic. Orton-Gillingham has been proven to effectively teach children, and can especially help children who struggle with the conventional methods of learning to read, write, and spell that are taught in the classroom. Using a multi-sensory approach allows children to learn through their senses, making it easier to retain information and make faster progress. Additionally, Orton-Gillingham focuses on an individualized plan to ensure that each child’s needs are met, and with direct instruction and continuous student-teacher interaction, each child is assured the attention he or she needs to succeed. Orton-Gillingham: Who Needs This Approach? have difficulty identifying the letters of the alphabet? have difficulty matching the letters of the alphabet to the correct sounds(phonemes) and vice versa? reverse letters when spelling or reading? pause at random points when reading a sentence, or stumble when reading? Students who need to work diligently on reading and writing until their skills are automatic; who keep trying and never quit.